"Ancestors, true bloodline, I ask you for your guidance. Bring me your solace and your wisdom. Blessed Mother, come to me in my dreams with the Gods' desire for my future. Blessed Father, watch over my people under the stars. Let them use the land and water and keep them safe until my return. Whisper to them in their sleep that I live only to hold them again and all else is dust and air. Ancestors, true stones, I honor you and will try to live with the dignity you have taught me." - Lord Pakal Ahau, Palenque, Temple of the Inscriptions, Winter Solstice 2012 A.D. - Mexico. "Antepasados, verdadera linea de sangre, les pido su guia. Traiganme su paz y su inteligencia. Madre Bendita, ven a mi en mis suenos con el deseo de los Dioses para mi futuro. Padre Bendito, vigila a mi raza por debajo de sus estrellas. Dejalos usar la tierra y el agua y mantenlos salvos hasta mi regreso. Susurrale a ellos en sus suenos que solo vivo para abrazarlos de nuevo y todo lo demas es polvo y aire. Antepasados, piedras verdaderas, Yo los honro y tratare de vivir con la dignidad que Uds. me han ensenado. -Lord Pakal Ahau, Palenque, Templo de las Inscripciones, Solsticio de Invierno. 2012 A.D. Mexico. 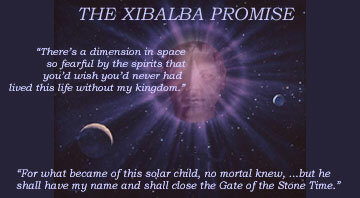 IMPORTANT: After Dec. 2004, a new website will be added to complete Lord Pakal's Trilogy. Lord Pakal Ahau's Maya Diaries in different servers. Thanks for your interest. As Lord Pakal Ahau told us...and that's only the beginning. Para todos los visitantes de habla hispana, Pakal Ahau hace una aclaracion importante. Este sitio no intenta formar religiones ni cultos y no pertenece a "gringos o gueros" en lo absoluto. latinas sean cada dia mas fuertes en nuestros paises de habla hispana. 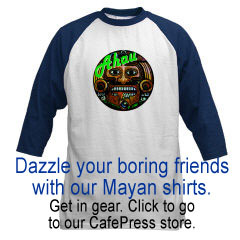 Don't Forget to Support the Official Lord Pakal's Mayan Store for Apparel and Cool Stuff. It pays for our slow dial-up connection in Palenque and have a visible presence in the web. one day after 2012 everything will change for our ignored and endangered Maya families and children. Apocalypse: a genre of revelatory literature with a narrative framework, in which a revelation is mediated by an otherworldly being to a human recipient, disclosing a transcendent reality which is both temporal, insofar as it envisages eschatological salvation, and spatial, insofar as it involves another, supernatural world. you can buy used copies at Amazon at a low price. Click here to go purchase them. RAM (Code for all works) by Lord Pakal Ahau - The Pakalian Group of Mexico is licensed under a Creative Commons Attribution-Noncommercial-No Derivative Works 3.0 United States License.